Sugar House Rotarians are active in humanitarian service - using their special skills, education and talents (and sometimes good old elbow grease) to help others in developing nations. Sugar House Rotarians serving food at our annual Adoption Awareness Event August 30, 2017. We join with the Division of Child and Family Services and the Adoption Exchange to bring together adoptable children and couples interested in adopting in a picnic environment. This environment is relaxed and affords the opportunities for children and potential parents to interact in a relaxed environment. Past events have had a remarkable success rate in having children adopted. 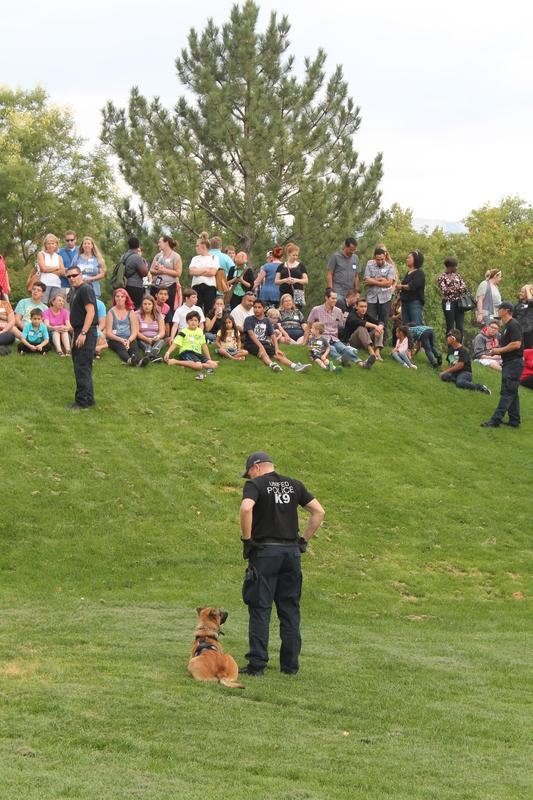 K9 demonstration at the Adoption Awareness Event. Watched by most of the attendees. Larry Wright, MD, retired infectious disease specialist, traveled to India to participate in the 2011 Immunization Day. Errol EerNisse and his wife Sonja Chesley traveled to India to participate in the 2017 National Immunization Day. Curing Preventable Blindness in Ethiopia - Julie Crandall, Opthalmic Technician, was part of a team of medical professionals from the Moran Eye Center @ the University of Utah. They performed ~ 930 surgeries to cure blindness or correct disfiguring eye problems that might cause people to be ostracized. The team also taught local doctors new ophthamology techniques. Correcting Eye Problems in Micronesia -Errol EerNisse and his wife Sonja Chesley traveled to Pohnpei, Micronesia, in July, 2015, with a Moran Eye Center team as non-medical volunteers helping with 145 eye surgeries to correct eye problems. Critical Dental Procedures in Nepal - Wally Brown, DDS, retired endodontist, has traveled to Nepal numerous times with dental supplies and performed surgeries and extractions throughout Nepal. Access to many locations required long hikes to reach mountain villages. There are very few dentists in Nepal so teeth are often extracted because of a lack of resources to save teeth. Infectious Disease Control in Africa and India - Larry Wright, MD, retired infectious disease specialist travelled to Africa to support local doctors in controlling the spread of challenging diseases. As part of the PolioPlus initiative, he travelled ito India to vaccinate children.